(LOS ANGELES) — Forest bathing does not require a swimsuit, an actual bath or even water. It does require you to bathe, metaphorically speaking, in nature, with all your senses open. If it sounds like a new-age trend, forest bathing, also known as forest therapy, is nothing new. The healing practice is an ancient tradition, formalized and researched in the 1980s in Japan, where it is known as shinrin-yoku. In the United States, it is a wellness trend growing in popularity that is offered in green spaces from New York City to Los Angeles. 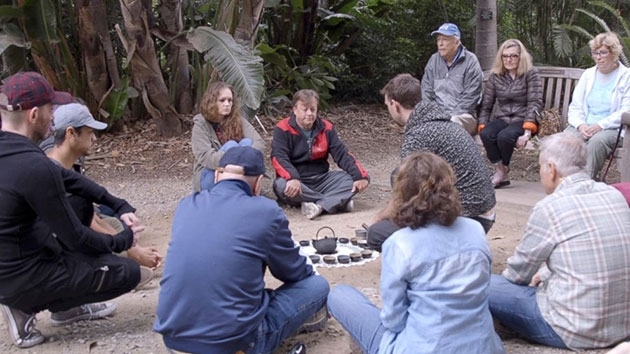 On a recent Saturday, nearly a dozen people gathered at the Los Angeles County Arboretum and Botanic Garden in Arcadia, California, to try forest bathing. A certified guide, Ben Page, led the participants through what is essentially an active meditation practice in the forest. The goal of the meditation is to not only create a peaceful space but to help participants find their own “authentic way of interacting with the land,” according to the Arboretum. Forest bathers do not hike, jog or exercise their way through nature. They stay still in it, connecting with the land through all five senses. Participants were invited throughout the course of the meditation to look at the tree canopies and the land surrounding them and reflect on what they were seeing and sensing, and how their bodies felt in the moment. Page encouraged participants at the Arboretum and Botanic Garden’s walk to go through the forest and collect “treasures” that they then shared with the group. Forest bathing is said to help boost mood and reduce stress. Walking in a forest or park regularly significantly reduced blood pressure and dopamine levels compared to walks in a city with the same people, one small study found. In another small study, forest bathing was found to significantly reduce pulse rate, significantly increase the score for “vigor” and decrease the scores for depression, fatigue, anxiety, and confusion among the men studied, researchers noted. The effects of forest bathing are similar to what is seen in meditation, according to Dr. Philip Barr, an integrative medicine physician at Duke Integration Medicine in Durham, North Carolina. Barr noted he likes prescribing forest bathing to his patients because it is a self-nurturing technique they can do on their anywhere at anytime. A pair of comfortable shoes is the only equipment required. Here are Page’s tips for forest bathing on your own. Find trees and green space! It can be a park, a garden, your backyard. Sit and relax for 20 minutes (That’s a baseline. You may find you need to go longer or shorter). If you find your mind wandering, tune into your senses. Think of how the spot feels, what it smells like and what it looks like.